The IATI Standard lets you publish information on your organisation’s activities and money flows. But how would you write something in IATI? The first case already showed different ways to do things. Here’s the second case, coming from an AidStream workshop with NGOs in the Partos IATI programme. Our organisation, called Us, is going to publish data in IATI. We found out that our organisation identifier is zz-us. We’re a membership organisation, with three member organisations who each pay €5,000 annually. We run Project 1, for which we receive funding from Donor A (€20,000). We also put €5,000 of our own money into the project. For the project, we work together with Partner X. It’s a network of freelancers and small businesses, with one Affiliate Y who is being paid from the project. We do most of the implementation of the project with our own staff. Based on the previous example, we’ll add a “core activity” again for our incoming membership dues. If we’re mostly doing the work in projects ourselves, do we add ourselves as implementing organisation to each activity? Since there will always be some work involved on our end, when do we include ourselves as implementing organisation? We don’t have transactions with Partner X, but with their Affiliate Y. 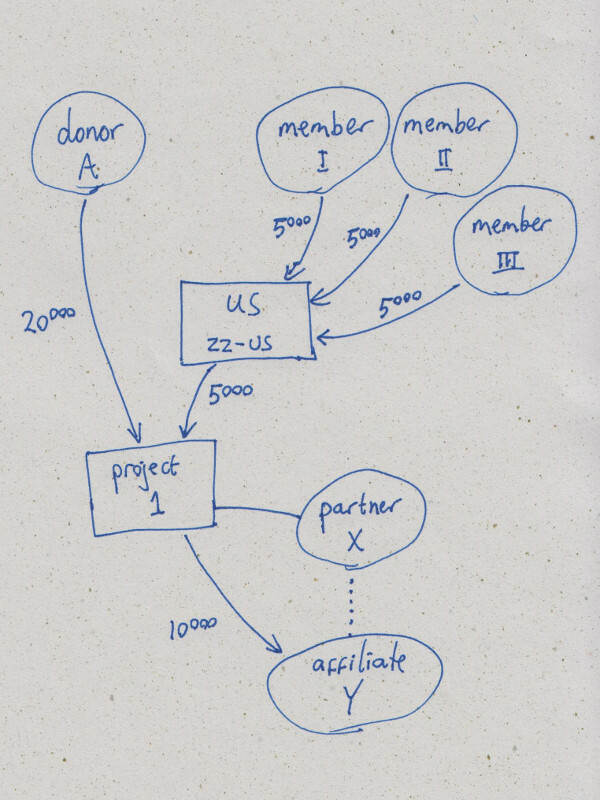 Do we include the Affiliate as implementing organisation or the Partner, or both? Related to that: a payment to Affiliate Y could be seen as expenditure or as disbursement. Is there a relation between organisation roles and types of transactions? If we consider IATI a language (and not as a database format, which it isn’t), we’ve got to look at both sides of communication. A “publisher” writes out a sentence to describe a situation. A “data user” looks at this sentence, and tries to understand what the situation is. Different ways to express yourself give freedom to the publisher, but make it harder for the data user. Although I’d love to see even IATI poetry (just as sometimes code reads like poetry to a programmer), clear and unambiguous communication benefits from agreements on how to express something. I hope discussing various ways to represent concrete situations in IATI will help grow common practices and eventually lead to conventions that give guidance to publishers and make re-use easier for data users.